A conservative average pay increase of 4.7 per cent is expected this year, going by findings of a report released yesterday. Still, human-resource experts said that the market outlook is not all that bad. Ms Sarah Ellis-Goldsmith, from recruitment consultancy Robert Walters Singapore, pointed out that the expected increment is slightly above the expected inflation of 3.5 to 4.5 per cent. "In line with that, candidates are seeing an average of 10 to 15 per cent (salary) increment when switching jobs," said the manager of Robert Walters' legal and compliance division. "The impact of this is that we are seeing some candidates choosing to look for opportunities outside of their companies in order to receive a higher salary increment than what their current companies can offer," she said. She also added that the employment market is still competitive, and good candidates with certain niche skill-sets continue to be in high demand. Ms Stella Tang, a director at human-resource consulting firm Robert Half, said that her company has also observed double-digit salary increases when employees move to another company, although no figures were provided. She said: "Looking at salaries across whole industries is a macro approach. What you really need to do is look specifically at individual job functions and you will see that some jobs are enjoying increases well above national or industry levels." She added that senior accountants at large firms, financial planning and analysis professionals, and investment analysts with a good track record still enjoy healthy pay rises. In a pay report released yesterday, management-consulting firm Hay Group said that an average salary increase of 4.7 per cent was observed this year, which in the report referred to the last 12 months to March 1 this year. The figure is a drop from the 5.2 per cent average increase for the 12 months to March 1 last year. The fall is also expected to continue, with a less-than-optimistic forecast of 4.4 per cent for next year, according to the report. On why the expected pay rise has fallen for this year, Mr Victor Chan, Hay Group's regional general manager for productised services, said that "organisations are feeling the need to manage business cost in a slower economic environment this year". He added that managing business cost was the top priority for nearly a quarter of the organisations surveyed (24 per cent) this year. Said Mr Chan: "Increasing wages in an optimal manner while supporting the long-term interests of the organisation is no longer an option. "Organisations should leverage on the Wage Credit Scheme to rationalise their reward programme and ensure that it is aligned towards individual and organisational performance," he added. 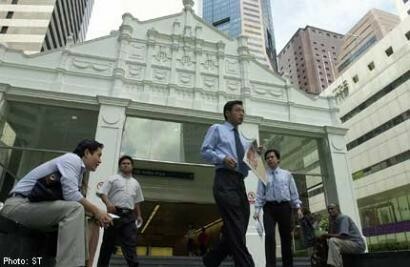 Under the scheme, the Government co-funds 40 per cent of wage increases given to Singaporean employees earning up to $4,000 a month, for the next three years. The report also said that the average variable bonus is expected to dip from 2.5 months last year to 2.3 months this year, with the average bonus expected to remain constant next year.